My name is Paul Choukourian and I am the current owner of the 1968 Shelby GT350 #1820. What makes Shelby #1820 special is a Paxton Supercharger. I have owned #1820 since 2004. When I bought the car, it was in excellent restored condition. All that I have done is add Mr. Shelby’s signature to the dashboard and install correct original style Goodyear tires. The supercharger documentation on the 1968 Shelby’s is scarce as from what I have learned, it was a dealer installed accessory in 1968, however #1820 has a few interesting characteristics and an ownership history that helps tell the story. First, the car has an original console with 4 gauges, instead of the factory two. The additional gauges are for fuel pressure and boost pressure. 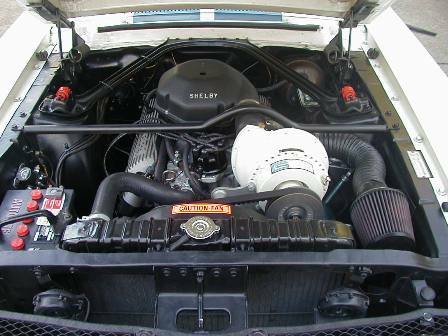 Shelby #1820 also has an opening on the front core support by the radiator that is not common for air intake. 1968 -1980 Original owner, name currently unknown. #1820 sold from Frank Cate Ford in Elk Grove, California. One person owned the car for the first 12 years. I have what appears to be the original owners manual and the name has been scratched out. The car was originally lime green and had white lemans stripes added at some point. The car apparently stayed in California for its whole life until 2003. 1980 – 1987 owned by Greg Braun. Took 3rd Place in popular vote at SAAC 6 in Monterey, CA in 1981. I have a picture from the track with the car labeled. 1987 – 1989 owned by Jim Groth. 1989 – 2003 owned by Glen Cable. I was fortunate enough to get in contact with Glen. Glen was the person who told me of the previous owners and Glen confirmed that the car came with a supercharger. When Glen bought #1820, it had 96,000 miles on it and was still the original lime green with white lemans stripes. Glen said that he had the car restored by Classic Productions, Ed Cook, in Sacramento in 1990. The entire car was stripped down and it took 14 months to complete the restoration. Glen decided to change the color to Wimbledon white with blue lemans stripes and also added aftermarket air conditioning and stereo. Glen removed the original engine and set it aside and found another 1968 302 block and had it built up including a six-pack setup. Glen claimed to hit 160 miles per hour on an oval track. Then in 1992, Glen, who serves in the Air Force, was sent off to England for 4 years. During that time, Glen’s father cared for the car including documenting every time the car was driven, with the date, distance and any work performed on the car. Glen has been a tremendous source for the history of #1820 and claims to have more paperwork with the original owners name and old photographs of the car. He was going to look for these items and send them to me as he found them. 2003-2003 owned by Brian Lee. Brian was at a Ford Dealership (Folsom Lake Ford) when Glen drove in with the Shelby. Glen was being sent off to Iraq for the Air Force and had taken the Shelby to see if the dealership would buy it. Apparently, the used car salesman did not know much about Shelby’s and Brian was able to strike a deal with Glen. Brian then drove out to Beale Air Force Base and picked up the original 302 block. Brian owns Classic Motor Sports in California and he turned around and quickly sold the Shelby. 2003-2004 owned by Jim Chatas. 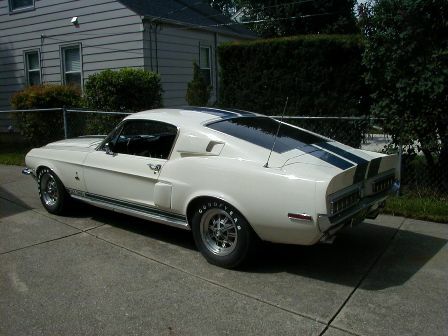 Jim had found this Shelby on a Mustang website and struck a deal with Brian Lee to buy it. He then had the car shipped to Michigan. I have known Jim for many years and we met while “Cruising Woodward”, which is a main road in Metro-Detroit known for beautiful classic cars on summer nights. Jim is the type of guy who takes a bucket of parts and turns it into and beautifully restored car and his specialty is vintage Mustangs. When Jim got #1820, the first thing he wanted to do was return it to its original glory so he removed all of the aftermarket parts including the air conditioning and stereo and re-installed the correct intake and supercharger. The thing about Jim is he seems to enjoy restoring cars more than he does keeping them, so even though he resisted at first, he called me one day and asked if I was still interested in the Shelby. He had found another Shelby that he liked and he had to make room in his garage. I promptly went to his house with my checkbook and took the Shelby home.